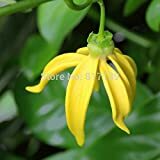 Ylang ylang plant for sale – Easy plant to grow with edible fruits, mostly grown for the ornamental flowers and for the leaves, planting in spring to autumn, better to buy plant or another option to start from seeds yet more challenging. Growing information: perennial plant, growing hardiness zone: 10b+, water needed – average to big amount, light conditions – full sun to partial shade, height: 5-30 m, 15-100 feet. Blooming in the spring to summer in hand with fingers shaped flowers that appear in yellow color. 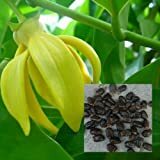 Ylang ylang plant for sale – When is the best season to buy Ylang ylang? 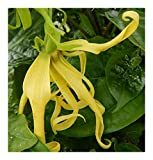 How to choose Ylang ylang when buy? 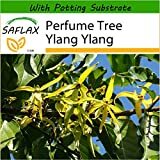 When choosing Ylang ylang tree need to decide for the purpose that for ornamental fragrant or edible reason or both, the trunk that there is no holes, pests and disease free, the soil clean from ants nest or other insect, need to check leaves that there isn’t distortion sometime it can indicate of disease, need to check that you get Ylang ylang tree and Not other species.